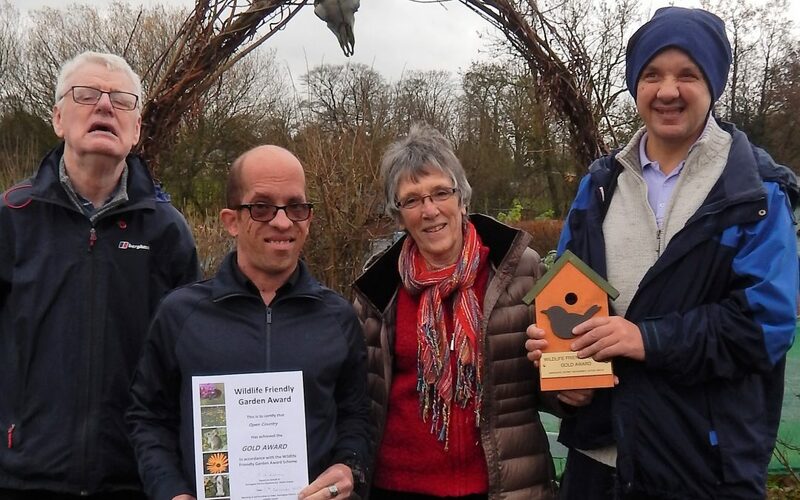 We are delighted to have received the Gold Award in the Wildlife Friendly Garden Awards for our efforts to increase the wildlife value of our plot at the Jubilee Allotments near Knaresborough. Harrogate District Biodiversity Action Group’s award scheme recognises the good work of individuals, groups and schools to help local wildlife by creating havens for bird and insect populations to flourish. Throughout the development of our allotment we have always taken into account ways in which we can increase biodiversity alongside growing fruit and vegetables. We have had our plot for over eight years, but in the last year or so we have added some extra wildlife-friendly features, such as bug hotels, bird boxes and a hedgehog home. Members of our ‘Wild About Wetherby’ group were presented with a certificate and plaque by Pamela Millen, secretary of the Harrogate District Biodiversity Action Group (HBDAG). The Open Country Allotment is a great place to take our groups, and they enjoy a variety of activities, including gardening, cooking, bushcraft skills, scarecrow-making and gnome painting! Our members learn practical skills, as well as food growing and healthy eating… we have used the produce from the allotment to make delicious : rhubarb jam, courgette chutney, onion soup, courgette fritters, onion bajis, sag aloo, salads and vegetable hotpots, kebabs and stir fries, as well as baked potatoes and barbequed sweetcorn. 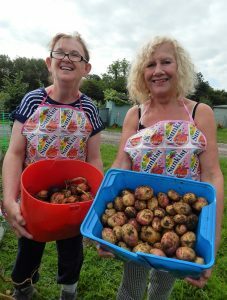 Last summer we won three second place prizes in the novice section for our potatoes, onions and raspberries at the Harrogate and District Allotment Federation Annual Show – this year we are aiming even higher!